We headed off to St Andre as the forecast predicted no wind there! 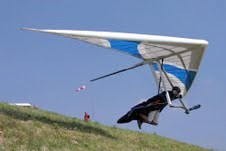 As it happened there was wind on take off and up to 20mph in the air – very St Andre! A small 50k task was set with 3 turnpoints – goal was at the ‘new’ landing field. I got as far as the 2nd turnpoint and decided to wind off 7,000ft and land as I had had enough of the crap air – it was v rough most of the time and I don't enjoy hitting the keel! It sounds like 1 chap landed in some trees and might be hurt bad – he is in hospital now, lets hope all will be well. BIG THANKS to Nicola for the retrieve today.